My first Sunday night in Bucerias, all of the interns went to dinner to celebrate the birthday of one of the interns, Anna. We ate at a restaurant called none other than Fat Boy right on the water. To leave our mark in this fine establishment, several of us wrote our names on the planks that held up the restaurant. This was not an idea we conceived ourselves but rather one that many other travelers and customers of Fat Boy had done. So what did this mean for us? 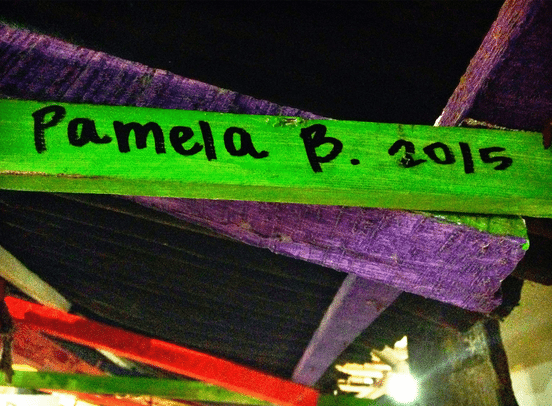 Is this how we would leave our mark in Bucerias – for some future customer to wonder who “Pamela B 2015” was? As I’ve been in Bucerias for over a week now, I have met the most amazing people. From my fellow interns to the mother of three who I was paired with in English class, there is something about Mexico that changes the people. The people here are so kind and generous to offer their time to speak with the gringa from South Florida who has never been to this place before. So in order to make my mark on this place, I must start with these people. Yet, this requires a different mindset than what I have been used to in the past. When you walk through a crowded market and people call at you to purchase their products, what is the first thing you do? I know for me, I put my head down and keep walking as if I never heard a murmur. This is not the appropriate reaction in Mexico. In Bucerias, it is considered rude if you ignore those who speak to you on the streets. A simple “no, gracias” will suffice to satisfy these vendors who spend countless hours in the heat every day to make the smallest amount of money. To me, this has been such a profound concept and I think it speaks volumes about the Mexican people. Forming relationships is a huge part of my time here in Mexico. In order to understand the needs of the entrepreneurs we are consulting, I need to immerse myself in their culture to fully comprehend the work that needs to be done. Why should I ignore these people when instead I could have a simple conversation? It does not have to be complex – just a simple “Qué tal?” is the first step in forming these relationships. But because I’ve been told so many times to just keep walking, this first step requires effort. Yet with practice and recognition, I become more comfortable with having these conversations and getting to know every person I encounter. A woman named Margarita has already had such an impact on me. The Business Innovation team is developing a dehydrator to dry wasted fruit in Bucerias. I went with two other interns on this team to the store Margarita manages to inquire about the dried fruit sold there. Within just a few minutes of meeting Margarita, we were laughing and asking each other about our lives. I managed to snap a picture of her while she was speaking despite her shy demeanor. Even though I’ve only been able to speak with her twice, I look forward to having the opportunity of walking past her store and saying hi. And this is how I want to make my mark on this place. Not on the piece of wood in Fat Boy or even this blog post on a website, but rather the conversations and relationships I form with each person while I am here.